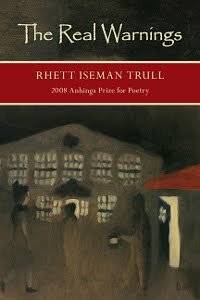 Rhett Iseman Trull's first book of poetry, The Real Warnings was published last fall and won the 2008 Anhinga Prize for Poetry. 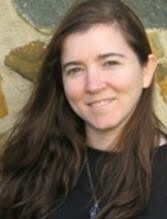 Her poems have appeared in numerous publications, including American Poetry Review, Best New Poets 2008, and Prairie Schooner. She received her M.F.A. from the University of North Carolina at Greensboro where she was a Randall Jarrell Fellow. She and her husband publish the literary journal Cave Wall in Greensboro, North Carolina. Q. In choosing your book for the 2008 Anhinga Prize for Poetry, Sheryl St. Germain says “Open this book up anywhere and you'll find a poem of fierce and uncompromising energy and insight . . . I've never read a poet who understands more fully the brutal paradoxes of love and of loving damaged things.” What influences or inspirations led you to poetry, and to these ‘fierce’ poems? It's easy. To enter, simply write a comment below, or send an email to dcm@drewmyron.com. Provide your name and contact information. A winner will be selected at random from the entries. But hurry! All entries must be received by January 30, 2010.